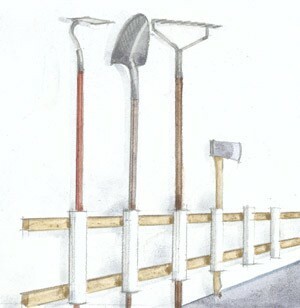 The methods we use to store items in the garage are different than in the house because we leave more out in the open. Utilitarian verse beautiful is often the rule. PVC is again an appropriate material for some of the ideas. 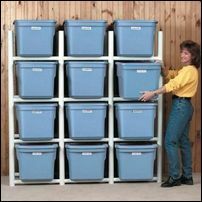 Here PVC is used to create a frame for holding standard storage bins. It adds an entire level of functionality in the ease of use department. 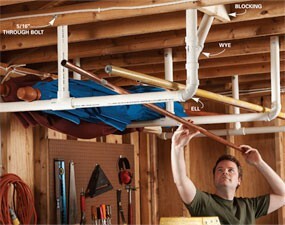 Here are two different ideas for maximizing the garage ceiling for storage, one with PVC, one without. 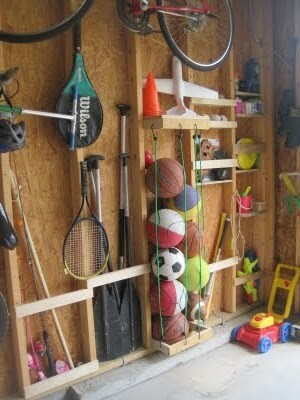 But my favorite idea for creativity is this use of bungee cords for storing game balls. A great garage is best utilized if there is a work-area like you have above that allows you to be hands-on creative on your hobby. 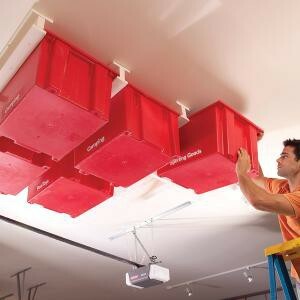 Plus with the right tools, you can bet you are not just keeping some space for just storage.